ICE Phoenix Field Director Henry Lucero says his agency has processed more than 14,000 families since December. PHOENIX — A surge in the number of immigrants released into the Phoenix area has put a significant strain on churches, which are scrambling to provide food, shelter, and aid to migrants on their way to reunite with family members throughout the country. Henry Lucero, the Phoenix field director for U.S. Immigration and Customs Enforcement (ICE), said the increased number of immigrants is putting a big strain on his department. "The volume has significantly increased. 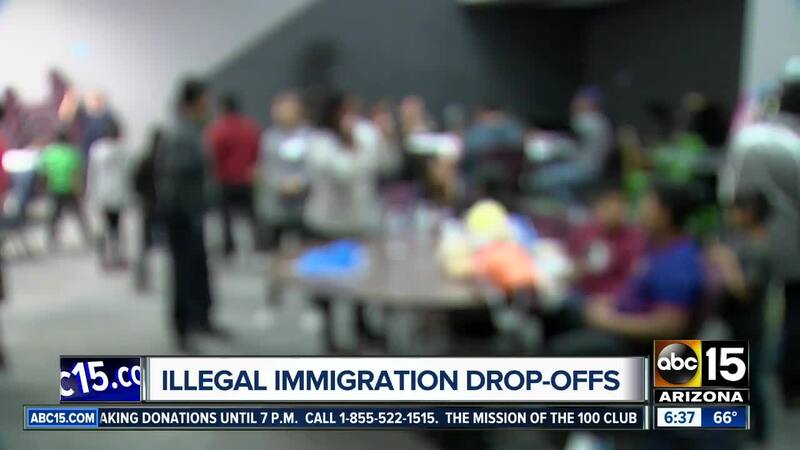 I can tell you from December 21st, 2018 to March 5th, 2019, we have released about 14,500 families in[to] the state of Arizona," Lucero said. Lucero said the agency previously processed about 50 families a day. Now, it's more like 200 to 300 a day with no additional resources. "Sometimes I have to pull officers off of other assignments to cover the workload for the day," said Lucero. In Phoenix, that means pulling agents who spent a big chunk of their time looking for immigrants who had committed crimes in the community. Lucero stated he also wanted to correct the record, after hearing many media reports saying that the majority of the migrants were asylum seekers. "Only five percent of the families we have released are claiming asylum," said Lucero. "Ninety-five percent of them have said they don't fear return[ing] home. I would say one hundred percent of them are coming here for a better life and some of them are fleeing something. Whether that merits asylum or not is up to an immigration judge, " he added. In terms of the big surge of migrants being released into the community, Lucero said a lot of it had to do with resources. "ICE only has available, for family detention, about 3,000 beds. There are zero beds in Arizona. The closest beds are in Texas, the other in Pennsylvania," said Lucero. Lack of bed space, combined with a court order known as the Flores Settlement, led to the big surge of migrants being released into the community, according to Lucero. The Flores Settlement agreement is a court settlement that was put in place about twenty years ago. It sets limits on the length of time and conditions under which children can be incarcerated in immigration detention. Lucero said it meant family units had to be released within 20 days of detention. "The message that is being received in these families coming in [is], if you come to the United States with a child, or with children, you're going to be released, either almost immediately with ICE or 20 days later if you go to a family residential center," said Lucero. He added that agents did their best to screen families and ensure children were traveling with parents, but there were instances where officials found children with a relative, and in rare cases, a stranger. When migrants are released from ICE custody, Lucero said they are given conditions of release that requires them to check into a local ICE office in the community they ended up in, not break any U.S. laws, and show up to immigration court on the dates they were scheduled to appear. Lucero said when releasing migrants into the community, they typically give them options. One option is to leave the facility on their own, which rarely any migrant does. The other options are to take them to a community shelter receiving migrants. The third is to drop them off at a transportation hub where they can catch a ride to wherever their families live. Lucero said most migrants chose to be dropped off at Valley churches or makeshift shelters as word had spread that they can get help tracking down family members there. Right now, Lucero said ICE works with 30 faith-based organizations in the Phoenix area which help take in migrants. When they are strained or unable to offer help, Lucero said they typically drop migrants off at the Greyhound bus station. Lucero said the churches helping out are not doing anything wrong. "If they were breaking the law, ICE wouldn't give them a ride there. They're just doing something out of the goodness of their hearts. Trying to help people find a way to where they're going," said Lucero. He added that he did not see the surge of migrant drop-offs ending anytime soon. "I would think it's going to continue until there is congressional action," said Lucero. ABC15 asked Lucero about allegations made by some migrants regarding the lack of water offered to them in federal custody. Lucero said that was absolutely not true. "We don't offer bottled water, which is what they're used to. Ninety percent of them are coming from Guatemala where they are not used to seeing water fountains. They're used to bottled water, so they say 'I'm not drinking that water that's not healthy,'" said Lucero. He added that they provide three meals a day and have snacks, fruit, and chocolate milk available for children all day long. "We treat everyone with compassion, whether they're a criminal or someone seeking a better life," said Lucero. Border patrol officials say they are seeing a 230 percent surge in migrant crossings this year. There is also a big surge in the number of juveniles crossing the border.